Welcome to SCUBA News. This month we've teamed up with Divebooker to offer you $75 off your next diving trip! See below for more details. It's official: the Galapagos islands of Darwin and Wolf have more sharks than anywhere else in the world. 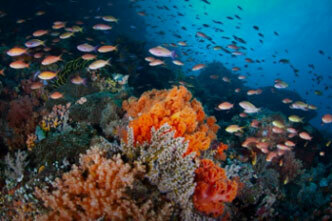 Madagascar, the world's fourth largest island, hosts one of the world's longest continuous coral reefs. The best time to go is between now and December. Amongst the highlights of Bali diving are the awesome Liberty wreck, the reef manta rays of Nusa Penida and the fascinating macro marine life of Tulamben and Seraya Secrets. We are planning a tour to NZ and would like to dive with dolphins or even more if possible with whales!;)??? Where in north island and who could operate such dives for group of people? Where to do Divemaster's Internship? Thanks for all the info on your website. So many dive sites to choose from! Very exciting! 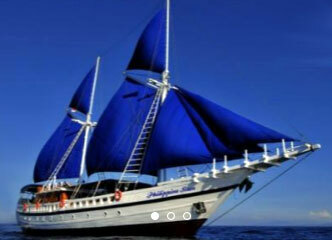 Currently, I am looking to do a divemaster's internship in the Indo-Pacific region around June/July this year. Can you recommend any places/operators? 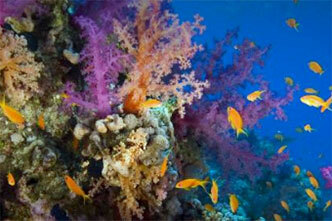 We've teamed up with Divebooker.com to offer you $75 off diving. You can use the voucher for further training, equipment hire, guided dives or towards a liveaboard almost anywhere in the world, anytime in the next 12 months. Divebooker list over 1000 dive operators and liveaboards in 63 countries, so you have plenty of choice of where to spend your voucher. You can book securely at their web site and one of their team will sort everything out with the dive company for you - confirming all the booking details. If you need advice - again the Divebooker team will be happy to help you. It costs no more to book with Divebooker than if you went direct to the dive operator. Indeed, they guarantee that if you find same services offered elsewhere at a lower price they will match or beat the price. If all that wasn't enough, every booking generates a donation to the Marine Conservation Society. So, what are you waiting for? Go to Claim your voucher now. Any drawbacks? Well, the offer is for new customers of Divebooker only. Let me know if you take advantage of the offer and how you spend your voucher. All 17 marine national parks in the Andaman Sea are now closed until Saturday 15 Oct - that's over 60% of coral reefs. But even after the rest re-open, Koh Tachai will remain off-limits. Degradable plastics, commonly used for shopping and rubbish bags, contain additives that make them disintegrate more quickly into microplastics than traditional plastics. When microplastics enter the marine environment they can poison wildlife and accumulate up the food chain, turning up in seafood eaten by humans. Accelerated acidification of coastal waters has brought about structural decline of only reef in continental US, initially pegged by scientists at around 2050. Advisers propose a cap on pollution from farms close to the Great Barrier Reef. Sugar cane, grazing and other sectors should be given pollution load limits for their industries in each catchment they say. The wrecks of Palau are revealed by Rod Macdonald. Each wreck is covered in detail and is supported by underwater photography and great illustrations by renowned artist Rob Ward.